Tube ball mill is widely used for grinding cement and other materials in building materials, metallurgy, mineral processing, power and chemical industries. The tube mill has characteristics of big crushing ratio, large production capacity, strong adaptability to materials, and easy to replace worn parts. Tube mill is composed of transmission parts, rotating parts, main bearings, and feeding and discharging equipment and lubricating parts. Tube ball mill is the very important fine grinding equipment in modern industry, and large pipe mill production capacity is very high. 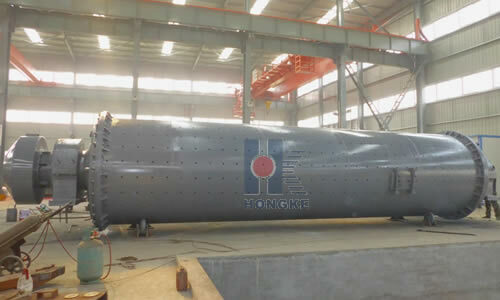 Length of single-chamber ball mill is difference is 2-7 times short ball mill. Material stays in tube mill for a long time with uniform product fineness and large crushing capacity. Mill cylinder is divided into several chambers by partition in compound tube mill. For each chamber, grinding body shall be matched according to fine grinding condition of material, which will make fine grinding of material to be conducted in stages to gain higher grinding efficiency with bigger power output per unit. (2) Big grinding ratio ( it is generally for more than 300, and ultrafine grinding can reach more than 1, 000). In addition, the fineness of product is fine, and the grain size distribution is easy to adjust. (3)It can adapt to different circumstance of operation: suitable for dry operation and wet operation, can operate in drying and grinding process operation. (4) Sealing is good, and it can operate in negative pressure. There is no dust float in the sky. (5). It is easy to large-scale, and can meet the needs of mass production of modern enterprise. Rawmaterials feed into hollow cylinder for grinding through hollow trunnion. Cylinderis equipped with different diameters of grinding media (balls, steel bars orgravel, etc.). When the cylinder is rotating around horizontal axis at acertain speed, and medium and materials which is mounted in the barrel underthe action of centrifugal force and frictional force will aches a certainheight along with barrel. When media and material gravity is greater than thecentrifugal force, it will escape cylinder body inner wall to fall or roll down,and ore will be crushed due to impact. Meanwhile, during rotation of mill, slidingmovement of grinding media have a certain abrasive action on raw materials.